Borgu, Kaiama, Ketaku, Ketari, Kettije. White coat colour with black ears and nose and sometimes black speckled; body is long and muscled, but with poorly developed hindquarters; dished head profile (Felius, 1995). Found in western Nigeria, in Kwara, Oyo, Niger and Ondo states; maintained by nomads and settled agriculturalists alike. 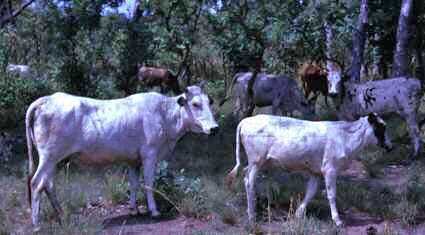 A stabilized cross of Savannah Shorthorn (Muturu) of the south and White Fulani of the north of Nigeria, with some input from N'Dama Longhorn. It shows wide variation of intermediates in conformation between zebu and humpless forms (Rege et al., 1994; Felius, 1995).